From the 18th through 21st of May (Monday through Thursday noon) the Fifth Princeton Conference on Space Manufacturing will be held. The biennial Conference will be co-sponsored by Princeton University, the Space Studies Institute and the American Institute of Aeronautics and Astronautics. The Conference site is the Woodrow Wilson School of Princeton University. The pressure for the inclusion of additional papers is even stronger this time than earlier, but the Conference organizers decided against parallel sessions, as there were (on an experimental basis) in the 1979 Conference. Our reasons were that parallel sessions reduced the cross-communication between scientists, engineers and humanists that had been an outstanding feature of the 1974 through 1977 Conferences, and that the book of Proceedings published by the AIAA became excessively costly and inaccessible to students when it had to accommodate the large number of papers that resulted from the use of parallel sessions. As in earlier years, attendance at the first three days of the 1981 Conference will be only by pre-registration through the Princeton University Conference office, at Prospect House, 3rd Floor, Princeton University, Princeton, NJ, 08544. The Thursday morning Summary session is open to all, free of charge, on a first ­arrival basis after Conference registrants have been seated. SSI’s largest grant in support of research, $100,000, is being awarded on the basis of a careful Review Committee process in which a number of outside reviewers took part. Agreements have been signed with Rockwell International’s Space Operations and Satellite Systems Division and the California Space Institute (a relatively new branch of the University of California system). The one-year program calls for investigation of the rates, temperature dependences, recovery efficiencies, etc. for some 33 chemical reactions required for the separation of simulated lunar soils into pure metals, silicon and oxygen. From that work, hard information should be obtained to allow the design and construction of test components of a complete chemical separation system. In his final months as NASA Administrator, soon after announcing his resignation from the Carter administration (which took effect on Inauguration Day January 20th) Dr. Frosch formulated and issued an internal NASA initiative addressed to all Program and Staff offices at NASA Headquarters and to the Directors of all NASA laboratories and field offices. It calls for the organization of a Space Materials Systems Program, and directs that a program plan be prepared for the approval of the next NASA Administrator by August 1, 1981. Dr. Frosch’s initiative opens with the preamble: “It has become increasingly clear that space materials may be an important resource for future U.S. terrestrial needs as well as for NASA’s future space missions …The new program in Space Materials Systems could be a vital component of our future space missions.” To guide the formulation of a Program Plan for this new initiative, NASA has formed a Steering Committee, on which I have agreed to serve. In January the entire acceleration section of Mass-Driver Two was brought into operation at Princeton for the first time. The tests were made using an interim single-phase capacitor-bank furnished by SSI, while the research group awaited the delivery of a high-performance 2-phase capacitor bank. The test results were in close agreement with computer simulations. We were particularly pleased that during these tests the high-power recharging system was in full operation and performed properly. Readers interested in understanding the basic principles of operation of mass-drivers should consult the Summer 1980 issue of this Newsletter. This winter, an independent review of all chemical, nuclear and electrical propulsion systems was carried out by a group at the Boeing Aerospace Division, under contract through the NASA Marshall Spaceflight Center. Details cannot be released, because the Boeing study is not yet published, but the general conclusions of the review were that the mass-driver appeared to be an excellent choice both as a lunar-launcher device and as an engine for inter-orbital transfers of freight. The situation regarding funding of the mass-driver research remains, however, as uncertain as reported earlier. Present funds are sufficient to carry the research through May of this year. During the past two years there has been a close cooperation of Dr. Scott Dunbar of Princeton (supported by SSI) and Drs. Shoemaker and Helin of CalTech/JPL, for the investigation of the possibility (indicated by Dr. Dunbar’s Ph.D. thesis) that there may be useful amounts of material trapped in the Earth’s orbit around the Sun. It is a pleasure to report that Dr. Dunbar has been granted a Fellowship by the National Research Council to pursue that research at CalTech with observations at Mt. Palomar. Dr. Dunbar will remain at Princeton, however, through the Princeton Conference. For the past two years I have been formulating a system which would employ a small number of satellites and simple, inexpensive equipment on each aircraft, to provide full protection from midair collisions and augmented capability for instrument landings for all aircraft from the smallest sport planes to the largest airliners. Now that the system design is complete, I have written an article on the subject, which appeared in the March 1981 issue of AIAA’s Astronautics and Aeronautics. The SSI Computer System (described in some detail in the Autumn Newsletter) is now in operation. Its programminq is being done by myself and by Mr. Lauri Kanerva, who is with us on a temporary basis. Mr. Kanerva, though only 21, has five years of professional programming experience and has won a number of mathematics prizes and talent searches. Over the next several months we will be transferring SSI’s records on Subscribers and Senior Associates to the computer system. We are making every effort to make sure that in so doing we avoid as much as possible the errors and foul-ups that are customary in the computerization process. We have published a new SSI information brochure, a copy of which is enclosed. It is particularly suitable for local photocopying, and we encourage your taking advantage of the opportunity to bring news of SSI’s unique role and goals to friends who may wish to become Subscribers. Additional copies of the brochure, in lots of 100, are available from the Institute for $15.00. In the last several years I have written a new book intended for the general reader. It is titled 2081: A Hopeful View of the Human Future. The book is scheduled for publication in May by Simon and Schuster and is being featured in trade advertising by the publishers. Excerpts from 2081 are to be serialized by OMNI Magazine in both its North American and United Kingdom editions, and the book will be featured in a new Science Book Club sponsored by Book Of The Month. I have written 2081 as a prediction, as accurate as scientific and historical research can make it, of what human civilization will be like a century from now. 2081 is in four parts: the first explores the previous history of prediction and the second identifies and explains the “drivers of change” (one of them being space colonies) that will shape the next hundred years. The third part is a tour through the world of 2081, and the fourth, “Wild Cards,” investigates the likelihood for such prospects as human extinction, immortality, antigravity, extra-sensory perception and communication with extra-terrestrial life-forms. Additional public lectures are provisionally on the calendar, but it is not our policy not to announce any lectures in SSI’s Newsletters until they are absolutely certain on the basis of signed contracts. With SSI’s new computer system it should become easier to inform Subscribers within a certain radius of a lecture and its date and time even if (as often happens) the lecture is arranged at relatively short notice. Rental: $30 .00 plus shipping, plus $50.00 deposit. Please specify tape format you prefer. 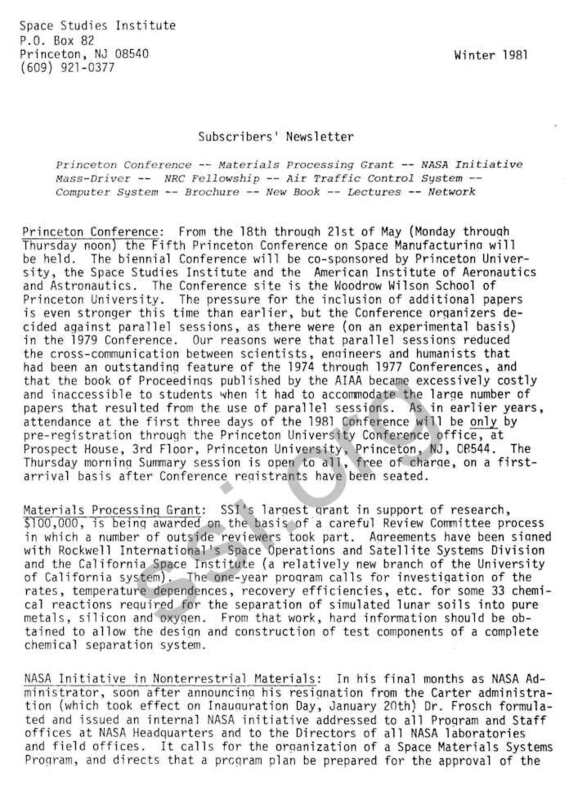 Right now CSSS is raising earmarked funds for the Space Studies Institute, in order to do more videotaping at the 1981 Princeton/AIAA/SSI Conference on Space Manufacturing. If you want to help so you can see a first hand report on the event later, send your check, payable to SSI, to: CSSS, 4Nl86 Walter Drive, Addison, IL 60101. (CSSS is administering the video­tape project.) Be as generous as you can –the cost of good equipment for the taping and the later phases of production is high. Gregg Maryniak thanks you in advance! 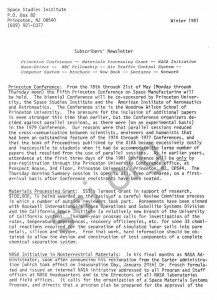 Update on Space: Volume I is the first in a series of lecture/synopses taken from the California State University, Northridge “Update on Space” summer programs of 1978-80. Edited by Sociology Professor B. J. Bluth and S. R. McNeal, the book can be ordered from National Behavior Systems, Grenada Hills, CA 91344. Send $7.95 and $1 each for shipping and handling. The L-5 Society Telephone Tree is a good place to be for fast news and action on space issues. Send your name, address and phone number to: L5 Society Telephone Tree, Tucson, AZ 85719. Your number will be forwarded to the coordinator in your state. L-5 Society membership is not required for this service.